The Big Ideas Generator project ran for 12 months across libraries in the 10 councils in Greater Manchester, through DCMS’ Libraries Opportunities for Everyone Innovation Funding. Our award of £250,000 was the highest amount of funding from the scheme, which was administered by Arts Council England. We last wrote in September, when the project had been active for around 3 months. This post updates the results shared then. Another benefit of the project was the provision of development opportunities for staff. 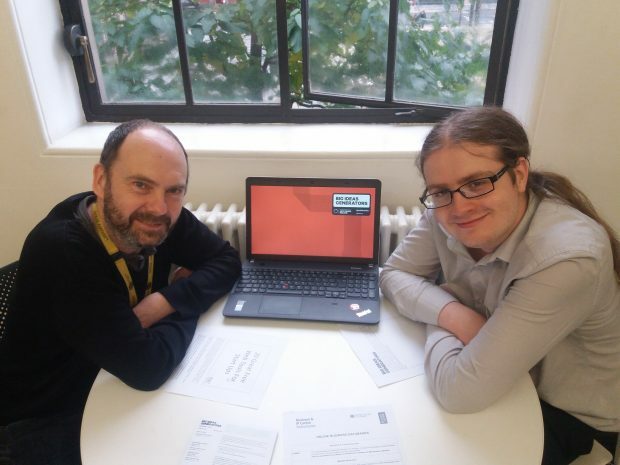 One of these staff members is Andrew Bailey, a Library Assistant from Oldham Libraries who was seconded to Manchester City Council for 10 months, and was one of the driving forces for the success of the project. This is Andrew’s account of being a member of the Big Ideas Generators team. Over the last 10 months I have had the privilege of working with a wonderful team delivering the Big Ideas Generators program across all 10 Greater Manchester authorities. Being seconded to Manchester City Council for this project has been a fascinating experience which has really opened my eyes to the way libraries are continuing to adapt to a changing world and the exciting and creative ways libraries can deliver in the 21st century. Everyone here has been so friendly and welcoming, I quickly felt “part of the team”. Working across all 10 Greater Manchester library authorities seemed like a logistical challenge when I first heard about the project. I am happy to say that thanks to the dedicated support of the local staff, both management and frontline, and the team based here in Manchester, we have been able to deliver with minimal hiccups! Workshops are delivered to small groups of up to 15 people on a variety of topics, from cloud computing to market research to 3D printing. I found that the more intimate setting allowed us to tailor the specific workshop to the attendees’ needs. The 1-1 sessions have been an excellent opportunity to speak directly with budding entrepreneurs and inventors and provide them with tailored help and access to the information they require. The Drop-ins were a later iteration of the one to one format based on feedback to provide a more flexible option for people unable to commit to a specific appointment slot, while also promoting our offer to a wider range of library customers. They were a great success and enabled us to help many people who would have otherwise been unaware of the help available. A big part of the project is facilitating the larger events at which external providers delivered high quality training to large groups. These are typically longer and cover particular topics much more in depth than a workshop, and are thus an ideal place to signpost people. This has also given me the opportunity to improve my own skills by attending. I am very grateful for the opportunity take part in this project, and hope that Greater Manchester Libraries continue to develop their working partnership to provide projects like this for the future. The evaluation included a 3 year projection based on BIG continuing: it is estimated that the longer term Social and Economic Impact is in the region of £6.5m. This projection adds to the legacy of the project, which includes closer co-operation between libraries and GM business support agencies, and the reinforcing of sustainable relationships with key partners. In addition it increases our credibility in shaping and influencing business support and innovation in Greater Manchester.